While it's tempting to believe a tool is the answer to better audience engagement, tech is just one part of the solution. Lasting transformation comes from changing the way journalists conceptualize the audience. We help newsroom staff transition from viewing the public as consumers to partners. We provide personalized and targeted consulting from our ace team of journalists throughout the lifetime of a Hearken subscription. We help newsrooms launch new projects and series, as well as spread public-powered journalism as a strategy throughout the entire organization. Once journalists are ready to think a little differently, our streamlined cloud-based platform comes into play. We've built a custom toolset for cultivating, managing and acting on the public's questions and insights. We call it the EMS. It's short for: Engagement Management System. The EMS keeps newsrooms from losing valuable public input in endless Twitter feeds and tucked-away corners of Facebook. It centralizes data and collects audience emails, allowing you to directly translate participation to user acquisition. The Hearken platform offers a variety of interaction points between the public and newsroom, ensuring that all editorial decisions can be made with the most complete information possible at the right time: when decisions are being made. Additional embeds can display the questions and stories you're investigating, and what others have asked, giving the public greater transparency into your process. The Engagement Management System centralizes all engagement for ease of action and collaboration within the newsroom. 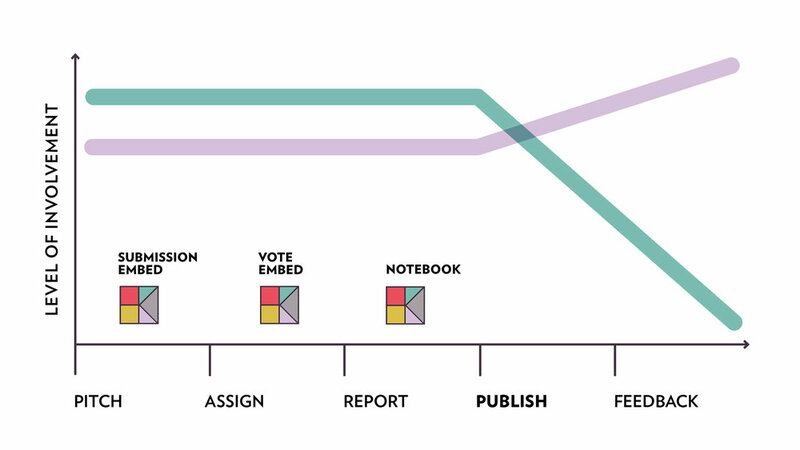 Hearken's notebook tool is the latest addition to the Engagement Management System. Learn more about it here. Custom progress reports provide specific, actionable recommendations to maximize engagement, lead generation and user acquisition via Hearken's public-powered process and platform. Hundreds of journalists around the world using Hearken connect through an online community. Here they share experiments, successful editorial and events strategies, and support one another in shifting the cultures of their newsrooms toward a public focus. Sign up with your email address to receive news and updates from your friends at Hearken. We promise to be interesting!